Organized as a drought relief camp, it was located on the White River south of Belvidere. 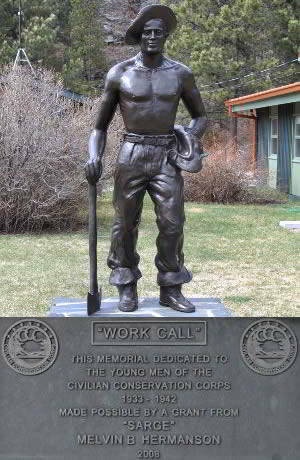 It was named in honor of Tom Berry, governor of South Dakota, whose home was nearby (1935). The CCC history states that the camp was 4 miles south of Belvidere, but the Jackson County map shows that the river is only 3 miles southeast of the town, via S. D. Highway 40. James Sjurson and a friend of his were both stationed at Tom Berry. Both believe it was only a mile or so from town. Company 2748 was at the camp from July 31 to October 20, 1934. It was then transferred to Camp F-15 (Tigerville). It was organized July 12, 1934, at Camp F-11 (Haselrodt) as a drought relief company. On July 30, it left from Custer by train for its new home. It arrived at Belvidere at 4 a.m. on July 31. Breakfast was served on the train, and the men began unloading. By night the company was settled in its new tent city. During the next few days everyone was busy building a camp road, hauling gravel, and cleaning the campsite (1935). 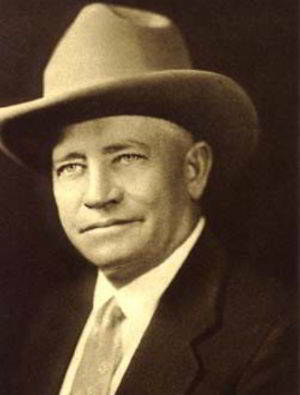 T. K. Moe, project superintendent, arrived August 3, and work began in clearing the area for the construction of a dam on Black Pipe Creek about 19 miles south of Belvidere (1935) which is probably 9-10 miles west of the settlement of Cedar Butte. Berry Is Not Benefited By Dam. Lynn Pier Says Project Boosted By Belvidere And Norris Commercial Clubs. Lynn Pier, Belvidere banker, today made public a letter sent by the Commercial Club of, Belvidere to Governor Tom Berry relative - to republican charges concerning the Belvidere dam. That letter revealed that the dam was a project of the Belvidere and Norris commercial clubs. 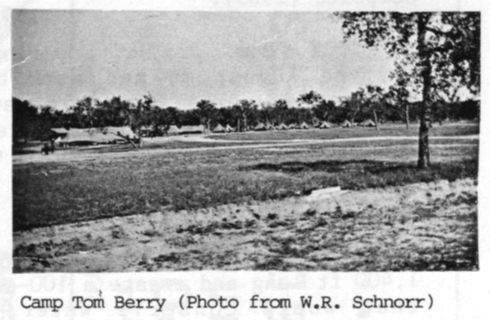 In connection with the letter, Mr. Pier stated that the dam, which republican campaigners-charge was constructed for the Berry ranch, is located several miles above the governor's land and instead of providing water for Tom Berry's stock will actually divert it into the artificial lake. The commercial clubs letter of explanation is as follows: Belvidere, S. D. Oct. 30, Governor Tom Berry, Pierre, S. D. The purpose of this letter is to give the facts about the dam 18 miles south of Belvidere, on Black Pipe Creek, about which dam a lot of erroneous and apparently malicious statements have been published, through the press and otherwise, in which it is termed the Berry dam. The idea of this dam originated about a year ago with some of the businessmen at Belvidere and Norris, not with the idea of providing stock water for the ranchers, as that section of the country is well watered by springs, but with the thought of getting an artificial lake on a stream fed by springs, as a fish and game preserve and recreation center. The location on Black Pipe Creek was selected by engineers to get as large drainage area as possible, far enough south to keep away from the sedimentation of that land drainage. 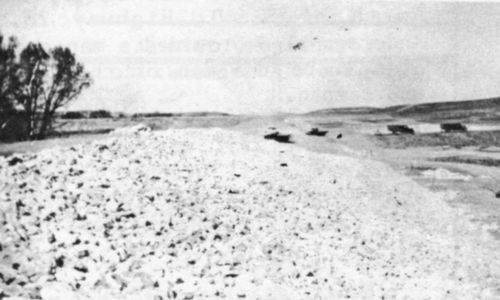 As a means of building this dam, a committee from Belvidere and Norris visited the federal officers at Fort Meade in charge of locating CCC camps in South Dakota and promoted the location of a camp south of Belvidere, with this dam as one of the projects. Several army officers came and inspected the project and the CCC camp site prior to the approval. The dam is 1,400 feet long, 25 feet high and inundates an area of 97 acres located on the only stream within a radius of 30 miles of Belvidere (excepting the White River) which could ordinarily be expected to fill a lake. It is midway between the towns of Belvidere and Norris, on a graveled highway. The location of this dam and the CCC camp and the building of the same is the result of the civic enterprise of the commercial clubs of Belvidere and Norris and is not chargeable to the personal interests of Governor Berry.